I recently unraveled a sweater that I must have started 23-25 years ago. 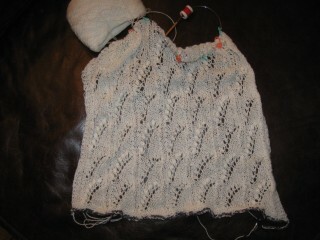 I stopped knitting on it with only 1 sleeve to finish, and somewhere along the line, I lost the pattern book. I did really like the yarn (70% cotton with acrylic – mottled look) and it knit up very evenly. So I ripped the sweater out, and reconditioned the yarn. I pretty well stopped knitting for about 25 years – quilted during that interim, but I seem to be back to knitting as my interest in quilting is waning. However, it does seem to me that close to a 25 yr timeframe is a long time to decide to rip and redo. But, far better than leaving it for another 25 years, and then having the kid pitch it from when clearing out the house!